The main ingredient in conventional Vaseline is petroleum. It’s a by-product of the oil industry and an unsustainable source (read not eco friendly). While the name brand Vaseline is highly-refined, triple-purified and regarded as non-carcinogenic, there are several petroleum jelly imitators on the market, and various grades of purity. While many health-minded people avoid petroleum products because they don’t want to take a chance with potential carcinogens, another good reason to avoid it completely is because it gives a false illusion of moisturizing and hydrating the skin. Chemically speaking, conventional Vaseline is water-repellant and not water-soluble. As such, it creates a seal or barrier to the skin when it’s applied and it locks in moisture. Temporarily, this might give the feeling of softness to the skin, but in reality it’s clogging the pores and not permitting any air or moisture to reach the skin. This is especially bad for skin conditions like acne and rosacea. Even applying Vaseline under the nose should be avoided because, if inhaled, it could cause lipid pneumonia. 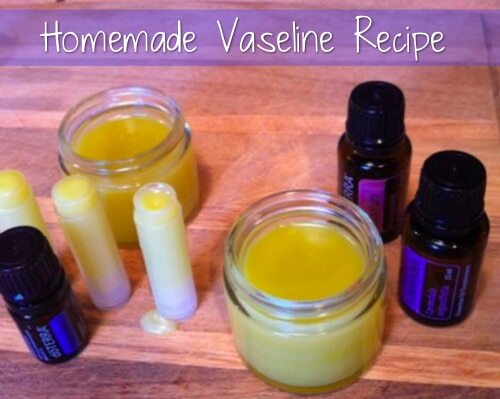 If you’re hooked on Vaseline (as many are), then consider this homemade natural version of it from Easy Home Made. The ingredients (there are just 2!) are all natural and can be absorbed into the skin.